If there’s one chef I’d be so lucky to have dinner with it would be the Barefoot Contessa herself (and Jamie Oliver, of course). You think they’d get along? 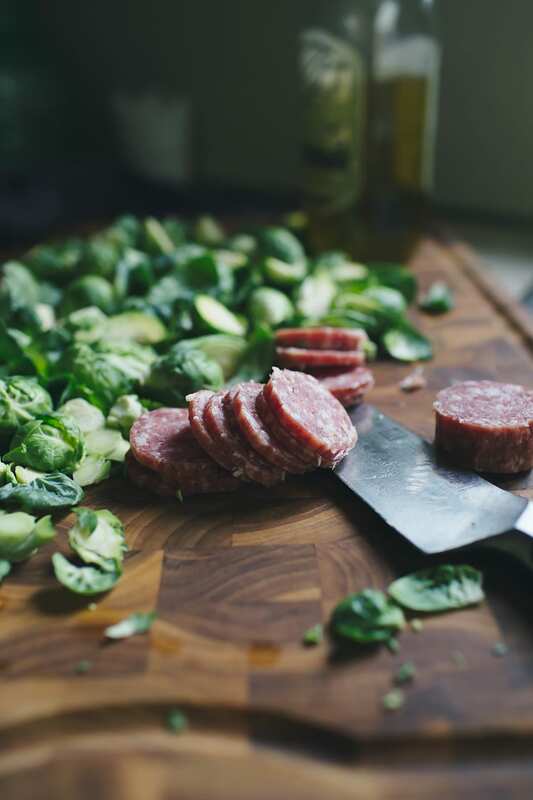 But enough celebrity crush talk for now… let’s get into some brussels sprouts! I could eat a whole bag/stalk of brussels sprouts. However they come, there’s just something about their slightly nutty, almost bitter flavor that turns me into a complete addict. I know not everyone is a fan of sprouts, but Ina’s super easy and flavorful recipe will most likely change your mind. Ina halves the sprouts first and then coats them generously with olive oil. She also includes any stray leaves onto the sheet pan. And I’ll tell you why- they get all nice and crispy once baked and the flavor reminds me of potato chips! But so much better! The sprouts are roasted with pancetta ( I used salami here) and then drizzled with thick balsamic syrup to finish. It’s the perfect balance of salty/sweet/bitter flavors. First, I had to edit my FACE out of the pan you see above. I almost didn’t catch the reflection! That would’ve been a sight (stop looking at the pan!). You can buy aged balsamic which is a nice, luxurious, syrupy vinegar that’s super expensive. Like, $90/ bottle expensive. You can buy a bottle of balsamic syrup itself at the store. It’s not easy to find but I know Trader Joe’s & Whole Foods carries it. You can also make your own, which is what I did. It’s super easy. BUT! I burnt it the first time around because it reduced so quickly it basically turned into TAR and the whole kitchen stunk like burnt vinegar which is one of the worst smells on the planet. My poor eyes. 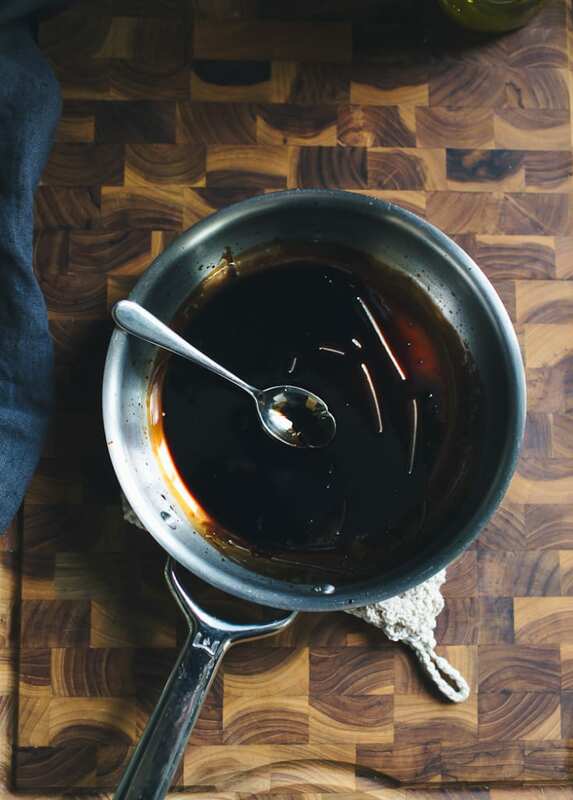 To make your own syrup, just add some balsamic vinegar to a small sauté pan with a little sugar. Reduce the mixture on medium-low heat; it will only take 1-2 minutes. If you dare walk away, say to check your phone or answer the door, I promise you will pay the consequences! *Pro tip: If your sauce is reduced, but you’re still waiting around for the sprouts to finish roasting, it might harden slightly if your kitchen is cold. This is what happened to me. All you have to do is warm it over LOW heat with a tiny splash of water. Stir continuously until the texture loosens up. See? Check it out! Crispy bits! Yum! You absolutely need this recipe in your life right now. For the holidays. Thanksgiving. Flag day. Earth day. WHATEVER. I promise, this one will be a hit! 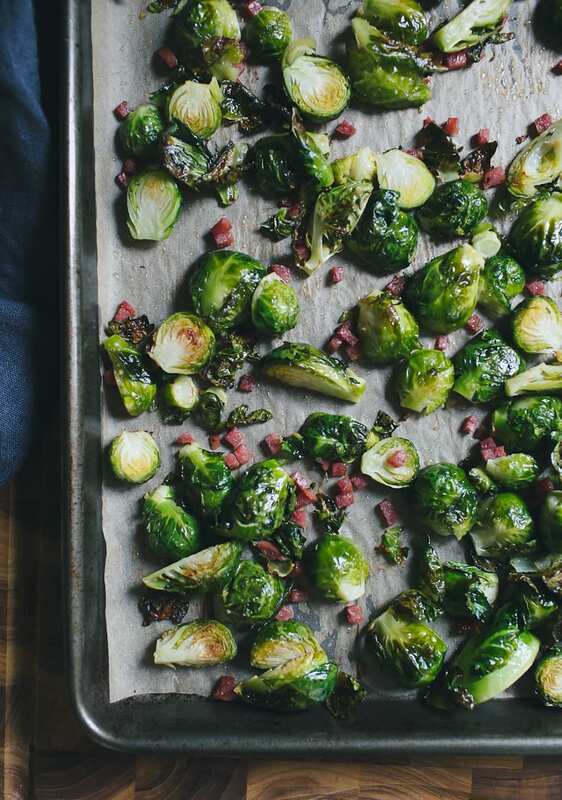 Tips: Don’t over crowd your sheet pan; the sprouts won’t crisp at all. Work in batches if you have to. Substitutions: For my veggie and vegan friends, you are more than welcome to leave out the pancetta or salami; it will taste just as good. My friend Amisha puts pomegranate seeds and walnuts in hers. Make-Ahead: if you’re making this for a dinner party, I would suggest trimming the ends and halving the sprouts one day in advance. Store everything in a ziplock bag (beware: it will stink the next day when you open it up!). Then all you have to do is roast the sprouts the next day. Easy. For the pancetta, you can buy it already chopped, which is nice. I used salami because that’s what I had in my cheese drawer, which is also nice. Again, you can pre-chop whatever you’re using the day before. For the balsamic syrup, I wouldn’t reduce it in advance. Make it fresh, unless you’re using syrup from the bottle. Preheat your oven to 400 F. Line a sheet pan with parchment paper. Add the sprouts and the reserved leaves to the sheet pan. Add the pancetta (or salami). Coat with olive oil and season with salt and pepper. Roast for 20-30 minutes, stirring occasionally for even browning. Towards the end of cooking, prepare the balsamic syrup. Pour the vinegar into a small sauté pan and sprinkle with sugar. Reduce the mixture over medium-low heat; it will only take 1-2 minutes. Keep your eye on it so it doesn't burn! You should end up with 1 tbsp of reduced syrup. When the sprouts are ready, drizzle the hot balsamic syrup directly over the pan. Toss well to combine. I absolutely love Ina Gartens recipe and this is not exception. I adore balsamic and this combo so much. I just found your page (strolled around on Teresa Floyd’s page: now-forager.com and she mentioned you in one of her posts) and I already love it. I want to buy your book right now! It’s so wonderful to find good books about bread and how to make it. 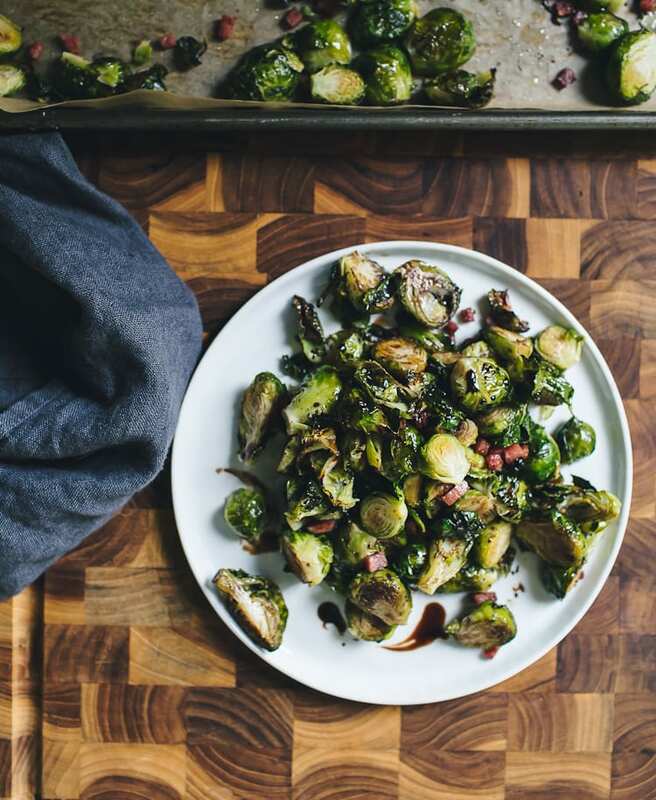 Your recipe Balsamic roasted Brussel Sprouts will be one of our Thanksgiving sides. I’m still not sure if I like them but my husband is really crazy about brussel sprouts. So, I’ll give it another try. I think I might like the vegan version (will use walnuts instead of salami, like your friend Amisha) with the balsamic syrup. Sounds pretty delicious to me. 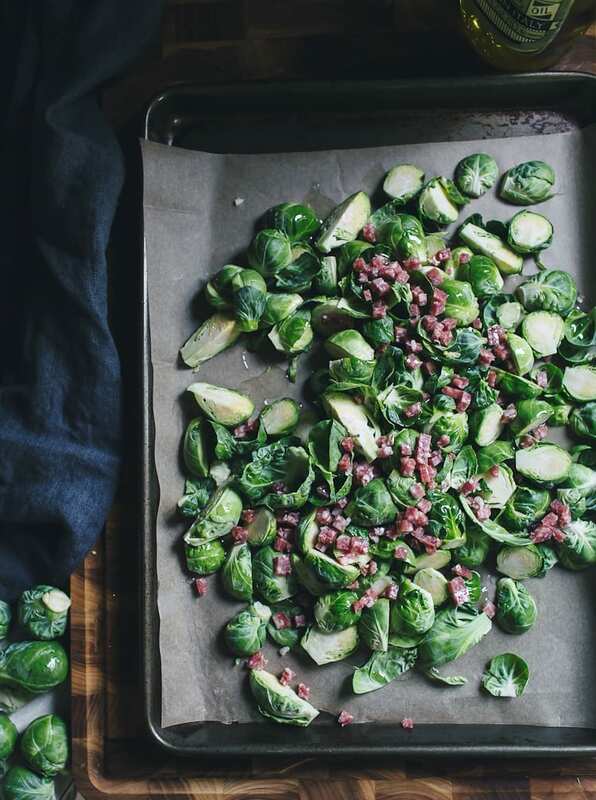 I love Ina too and these brussels are the perfect holiday side! I got a question. For this dish does it match with other dish, like this can add in to salad or other dish that’s possible to add this in?